It was proposed to be done a hundred years ago with the signing of the Declaration of 1899. It is necessary for all the specialists and experts to meet and discuss this parameter, take it as a basis for the design of small arms and ammunition. It is necessary for experts of all countries to gather at a conference to discuss the standard cartridge for military small arms. 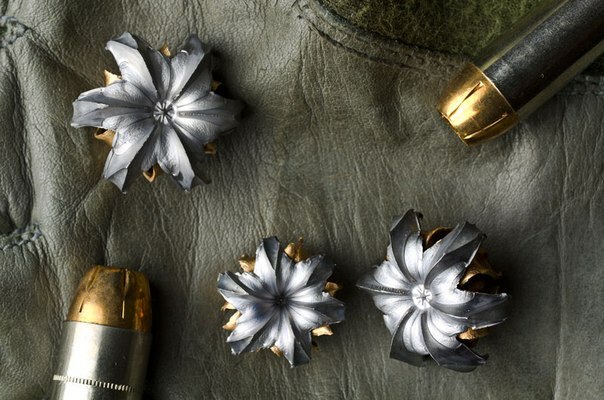 The following parameters are suggested for slaughter action bullets cartridge for military use for rifles, carbines and pistols: kinetic energy distribution up to 300 joules for the average wound channel length of 14 cm. European experts suggest no more than 25 joules per 1 cm of the wound channel - which in principle is the same. Today USA plans to pompously celebrate the 100th anniversary of the Colt M1911 (A1). These events will surpass the celebration of the 60th anniversary of AK in Russia. We have to congratulate the American experts on small arms. US citizens successfully kill each other with explosive bullets, which does not exist in many countries. This has the merit of their favorite gun against the horse. DECLARATION ON THE USE OF EASY TO DEPLOY AND FLATTENING BULLETS, The Hague, 29 July 1899. The undersigned, authorized by the Powers that participated in the International Peace Conference at The Hague, having received proper authority of their Governments for this, inspired by the sentiments which found expression in the St. Petersburg Declaration of 29 November 1868, Declare: The Contracting Parties agree to abstain from the use of bullets which expand or flatten easily in the human body, such as bullets with a hard envelope which does not entirely cover the core, or is pierced with incisions. America in the 20th century caused a stir not only with the pistol 45 caliber, they also produce explosive (expansive) bullets for pistols. Expansive bullets literally fit all calibers of small arms. The United States is a threat all over the world, they are always the first to develop new weapons, undermine parity in conventional weapons, do not comply with international agreements. Nuclear weapons must always be directed to that dangerous country - the "evil empire", that’s what the General Staff of the Russian Defense Ministry is doing. The criminal American shooting school has a significant negative impact on education, moral character of each soldier (user) - "the enemy must not only be killed, it is better to tear him apart." The pistol is a personal weapon of all power structures, and therefore the hateful propaganda gradually permeates the whole of society. Note: Special forces Soldiers are trained to shoot from all positions. This is done for a long time. Written above is the critical primarily for the mass consumer. You may not agree with the opinion of the author and shoot with two hands, it's your problem. If in the United States you do not need experts, we can substitute them. Today, Colt 45 caliber is literally imposed on countries joining NATO. Students are trained with the American shooting school, weapons market is readying to get captured. Heads of state do not understand the "history" of pistol Colt and "the concept of choice": shooting at unarmed, violations of the Convention and a big threat for the shooter to get a bullet in return. The shooter is turned with his whole body to the enemy, and the time to open fire is increased - until the shooter with his both hands does not take up a gun, he does not feel confident. There is a delay that is deadly at close range. When creating technical specifications for the manufacture of guns it must be determined on what market they were going to sell the weapons and for what school of shooting it is done. Hollywood creates a positive attitude in the Russian population to the American school of shooting - it looks good in the movies. It began to be considered a good tone to shoot with two hands in the security agencies as well. It proves the lack of knowledge among teachers and training in shooters themselves, previously they had been taught for a long time and seriously. Based on the above, it is possible to agree with the American patriots, and conclude that the American shooting school was formed not under the influence of the conditions of the use of weapons, but only in order to adapt the shooter to the hand gun intended for shooting horses. All European countries have been inspired by the Declaration of 1899 and the Convention of 1907, the experts discussed the peace initiative of Nicholas II, pistols and cartridges of 7.62 mm, 9 mm with a muzzle energy of close to 300 J were taken into service. At the same time, American experts in 1906 have tested a new pistol cartridge .45 meant for cattle ... (see. http://www.sightm1911.com). Given such evidence, it is possible to further consider this quote: "In 1908 a military commission, basing their considerations for caliber .45, indicated that it best meets the requirements of the army and stops a galloping horse". That is, the gun was originally designed for cavalry weapons and firing at the cavalry. For the shooter the horse and rider were the target. This is a rather large target and low accuracy met the needs of the army. This explanation is quite logical. American shooting school (option number 2). American patriots disagree with the negative assessment of US military history from the Russian specialists. They argue that the "shooting with two hands in America began after 1950" - after America dropped atomic bombs on Japan, and provided justification for the bombing. As the proof of this statement the instruction of 1940 to the gun Colt M1911 (A1) (see. http://www.sightm1911.com/manual/manual.htm) is provided. FAQ (see http://ru.wikipedia.org/. 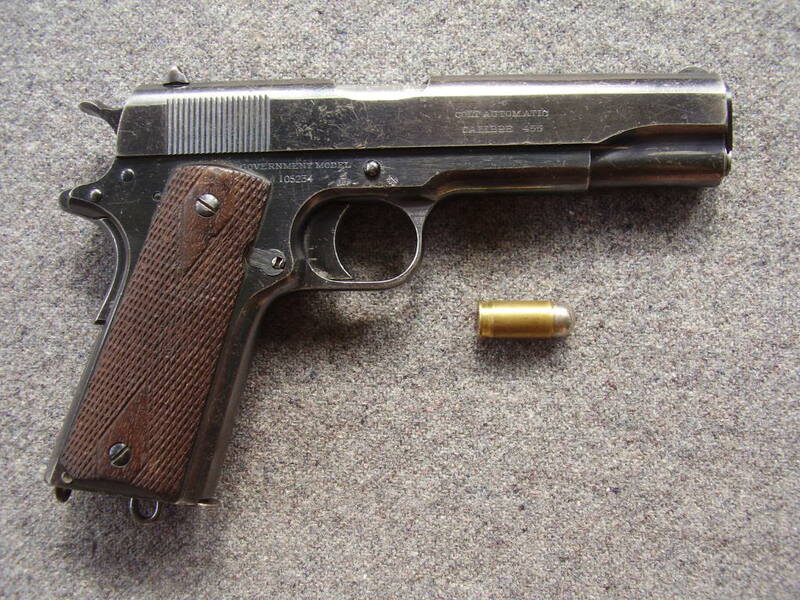 ): The M1911 Colt (A1) is a semiautomatic pistol of caliber 0.45ACP. It was designed by John Moses Browning in 1898. The gun was in the US Armed Forces arsenal for eighty years, from 1911 to 1990. M1911 was widely used during World War II. In turn, the model A1 has spread in the Second World War, the Korean and Vietnam wars. Colt was back in demand during "Operation Desert Storm" (Author's Note: For shooting at Iraq cavalry?). Colt 45 caliber 1911 g sample - M1911(A1) became the US cult gun. Possession of this gun has a hidden subtext, which is understood only in the US and is not accepted to openly say: "the Whites want to own a Colt 45, to remind the blacks of their place in society, and the blacks want to have a 45th Colt to catch up with whites" (popular opinion of experts). From the point of view of the army, the gun is cumbersome and heavy, has low accuracy. To wear it constantly, it is necessary to think of ideological justification. I’ll remind that racism is forbidden and began to be pursued in the United States only after the 60-ies of the last century - it’s all very fresh. To openly write on such topics in the United States is not accepted. The absence of a large-scale military conflict on the territory of North American continent has not created conditions for the formation of the military culture of the use of weapons (a reasonable limit). Under these conditions, formed the American school of shooting - with two hands with large calibers at short distances. It was precisely for this shooting school that weapons are made . in television reports, you can watch the soldiers fire from a Colt at height targets from a distance of 5-7 meters. The American shooting school (Russian version). To briefly describe the American shooting school, the primary use of handguns (revolvers) in America was to protect the settlers from the Indians and slaves (blacks on the plantations). Shooting at virtually unarmed enemy, or when he is armed with a garden tool and is not able to fire with the same weapons in response. This shooting is at very close range with maximum stopping power of bullets (large caliber), "so that falling rakes would not touch the planter ..." (popular version). The Russian shooting school (dueling) is shooting with one hand with a turn of the body. Conceptually, this is reflected in technical assignments and further on in the Nagant system (7.62 mm) revolver and TT (7.62 mm), PM (9 mm) pistols. If the shooter was taught at the beginning to hold the weapon in a certain way and not otherwise, then in a combat situation he unwittingly will take the usual position. It's like handwriting, impossible to change. In Russia and Europe as a whole, in the last century, duels were widespread. All this together formed the Russian school of shooting: shooting with one hand at an armed enemy, who is always ready to shootback. A U-turn of the shooter’s body reduces the area of ​​the injury from oncoming bullets. In the period from 1860 to 1898 formed a military culture based on the concept of attacking the enemy on the principles of reasonable sufficiency (see. Convention 1907). Russian shooting school was formed against the background of constant warfare, where the gun was not a primary weapon. During protracted military conflicts an officer was armed for weeks, months and years. To keep heavy weapons in such circumstances was completely unreasonable. History of pistols began a long time ago. The most important feature of the gun is its ergonomics. Therefore, analyzing the development of the gun in terms of its ergonomics, it’s possible to most accurately show its history and trends. The main influence on the formation of the concepts of guns affected the conditions of the use of weapons. This, in turn, formed the American and European (Russian) schools of shooting. Expert for technical and ballistic examination, Russia, Samara.